The moving, true story of the young woman dubbed "The Voice of America's Bullied"; how her bond with her dog, Izzy, changed her life; and their mission to help break the cycle of bullying. In middle school, Gabrielle "Gabe" Ford developed a degenerative muscle disease, and was harassed by bullies as a result. She did her best to keep her head high, but it wasn't easy. Then Gabe got a dog, Izzy, who developed an uncannily similar disorder. They were invited to appear on Animal Planet to talk about their bond, which in turn led to an invitation to speak at a school. And so began Gabe's career as an anti-bullying advocate. Dubbed "The Voice of America's Bullied" by the Huffington Post, Gabe now makes a career of public speaking and has received numerous honors for her hard work. Here is her amazing story--from her lowest days dealing with various challenges, to the unbelievable and immediate bond with Izzy, to her ongoing mission to put an end to bullying, one school at a time. Gabrielle Ford never dreamed that a long-eared coonhound could change her life. But that's just what happened when she cared for her ailing pet Izzy and found the voice to help others in need as a nationally-known motivational speaker. Today Gabe's incredible story has drawn media attention from The Today Show, Cosmopolitan Magazine and Animal Planet, among others. As a child, Gabrielle loved dance and dreamed of becoming a prima ballerina. That dream was shattered by a rare genetic neuromuscular disease, Friedreich's Ataxia, that would eventually place her in a wheelchair. Gabe not only struggled with the devastation of the illness, but also endured constant and cruel bullying from classmates. The constant torment took her on a path of depression and isolation. 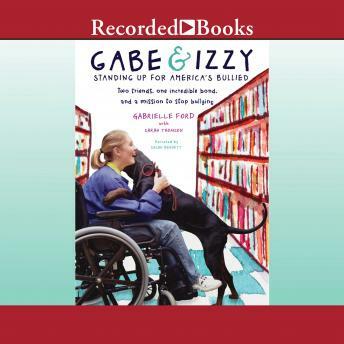 That all changed when Izzy, a long-eared coonhound pup, entered Gabe's life. Izzy became Gabe's best friend and constant companion. When this special friend mysteriously developed a condition mirroring Gabe's, Gabe re-entered the world to get Izzy the best treatment available. Speaking out for the voiceless Izzy gave her the courage to speak out for another voiceless group: the thousands of children bullied in American schools every day. Through countless personal trials, Gabe found her way back to the stage as an outspoken advocate against school bullying. In addition to her countless school visits, she has also been a keynote speaker at various conferences and conventions. Her dedication even earned her the 2011 Communications & Leadership Award from Toastmasters International, The 2011 Peace Maker of The Year Award (Gandhi Award /Genesee County MI), as well as the Community Hero Award in 2008 from the Fenton Regional Chamber of Commerce.